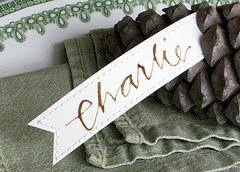 Recently I discovered the most beautiful calligraphy on etsy. Primele has the most beautiful envelopes I have ever seen. They are so whimsical and fun. 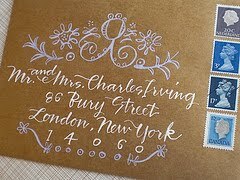 What fun would it be to receive an envelope like this? 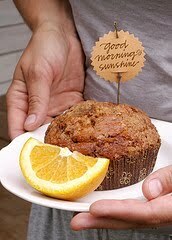 Placecards like this are sure to please your party guests. 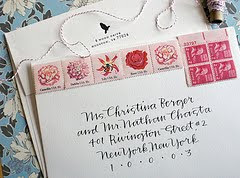 Primele has gorgeous options for invitations, too! The faces behind this contemporary calligraphy belong to three sisters, Kim, Patricia, and Rachel. 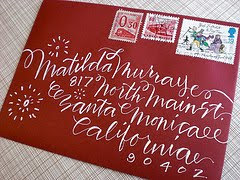 Patricia is the calligrapher and illustrator. Her blog, Patricia Mumau, has stunning visual images and creative ideas. The design studio is based out of Yates, New York. I'm thinking that these might be fun Christmas card address options. If I can get myself organized, I would love to do this. 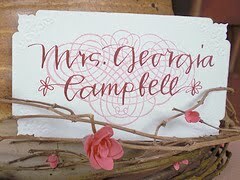 What do you think about this modern calligraphy? I loved the writing on the red envelope!! I would love to learn to write like that. Thank you for sharing! I love it!!! 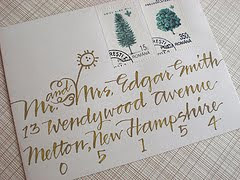 Calligraphy is so much fun... it really is like art. I just bought myself a true calligraphy pen last weekend (the ones with the ink well). I've been using the marker-like pens and decided to try the ink well. This is so beautiful! I guess one would need to know well in advance who they wanted to mail to! What a gorgeous talent! I would love to be able to sit down to an envelope and make something beautiful out of it. My best attempt is to write with a calligraphy pen and it makes my usual writing a little more special.